Grader: Second issue (1863-67 )2 5 cent. Fractional Currency notes were issued from August 21, 1862 through February 15, 1876. Secretary of the Treasury Salmon Chase proposed to authorize postage stamps of some type as a new currency. Much of the public were using stamps as in lieu of change due to a severe shortage of coins. The post office did not like selling stamps for currency and they did not provide refunds for soiled stamps. Congress and President Lincoln approved the Postage Currency Act on July 17, 1862, which authorized an issue of 5, 10, 25, and 50 cent notes. The 1st Issues became known as Postage Stamp Currency because they bore facsimiles of the then current 5 and 10 cent postage stamps. 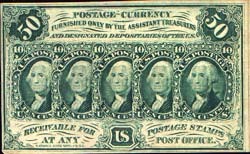 Postage Currency (1st Issue) were never legal tender but could be exchanged for United States Notes in $5 lots and receivable in payment of all dues to the United States, up to $5. In the first few months of production, the sheets were perforated like stamps. These sheets were sold to banks and the public in sheets and you could tear off the notes needed with ease. The perforating machine could not keep up with the heavy demand so the banknote company started producing plain sheets that were cut with scissors. In 1863, Secretary Chase asked for a new Fractional Currency that was harder to counterfeit than the Postage Currency. The new Fractional Currency notes were different from the 1862 Postage Currency issues. They were more colorful with printing on the reverse.